"There’s something for everyone in Aiken," says Carla Cloud, who is the executive director of the Aiken Downtown Development Association (ADDA). "That’s the theme of our current marketing effort. We have antiques, art, shopping, dining, spas, whatever you might want." 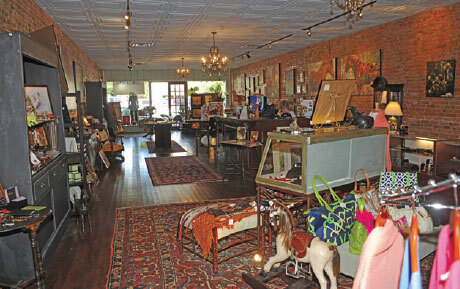 The ADDA is devoted to ensuring the health of Aiken’s downtown shopping area. "We try to be a resource for businesses and to help the community understand how important individually owned shops are," continues Carla. "Economically, it is much more of a boost when you shop in locally owned stores – so much more of the money stays in the community." Efforts to keep Aiken's downtown vibrant started back in the 1980s, when malls were being constructed on America's highways and many small cities and towns across the country were seeing businesses wither and die on their main streets. "There was a group of business people headed up by John Cunningham who were very savvy and knew what they needed to do to save downtown," continues Carla. "They did a remarkable job. I get lots of compliments all the time. People will say to me 'Oh you’re doing a great job!' I have to say 'Honey, all this was done way before me. We’re just carrying on what they did.'" Aiken's downtown is just a few blocks long, but it has a wide and varied collection of shops that give every indication of thriving, even in the current economy. Aiken is often said to have a small town atmosphere combined with big city sophistication. This character is reflected in boutiques that offer surprisingly cosmopolitan items – the kinds of things you might expect to buy in New York City, Los Angeles, Palm Beach, or even London – not what you would anticipate finding in a small southern city. And yet, with all this sophistication, the majority of the shops are intimate. You are likely to find their owners at the cash register, and for many, the store is clearly both a labor of love and a deeply personal expression. Aiken’s boutiques tend to reflect their owners' personalities, and are often stocked with items that the owner would buy, use or wear. One new business that exemplifies this aspect of Aiken’s shops is Aiken Dry Goods, which opened at the end of March on Laurens Street next to the Hotel Aiken. 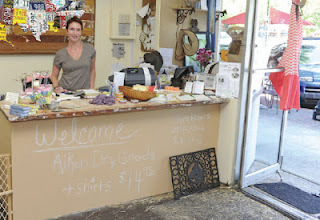 Aiken Dry Goods is a joint venture between Jami Chandler, who recently moved to Aiken from Saratoga Springs, N.Y., and her partner Matthew Fonseca, a 3-goal professional polo player who lives and plays in Aiken. The back wall and the back room of the shop are devoted to polo gear – bridles from Argentina, Tato’s Mallets and Casablanca saddles, polo boots, whites and gloves. You can even buy authentic Aiken Polo Club polo shirts. The front of the store is dedicated to fashion, jewelry, soaps and décor items. "We have clothing by Free People – that's very popular and hard to find around here," says Jami, "And t-shirts from Dang Chicks. We're also getting in some Argentine-style rawhide belts soon." There are various hats, riding clothes by Goode Rider and Gersemi ("the equestrian brand that has a passion for style," according to their website), summer dresses by Judith March and rings and bracelets crafted from antique silverware. The store is decorated with antiques, "found" items and things that have been repurposed. For instance, there is a large map of the United States hanging behind the cash register that is made entirely of used automobile license plates from all 50 states. Other walls display antique farm tools, a rusty weathervane, an ancient American flag. The feel is part Americana, part Bohemian, part modern and trendy. One overriding theme is a love for horses and dogs. Jami's dogs are generally with her in the store. You can donate to Aiken’s Friends of the Animal Shelter at the cash register, or buy t-shirts made by the dog-friendly designer Barkology that proclaim "Sleeps with Dogs." Jami admits that the items in her store are pretty much selected because they are things that she likes and would wear or decorate her house with. "New Free People arrival . . ." she writes on the Aiken Dry Goods Facebook page, "Please come shopping before I buy it all for myself." The overall feeling of Equine Divine is of a kind of elegance that comes from being surrounded by beautiful things. This atmosphere emanates from the artwork that hangs on the exposed brick walls. "I have fabulous artists, primarily from the Southeast," says Taryn Hartnett, the owner of the store. "But I also have Melinda Brewer, who is probably the leading polo artist in the country. I’m fortunate to be able to represent her." Although Melinda lives in Canada, she comes through Aiken on a regular basis, generally when she is on her way to Palm Beach, where she creates polo pony portraits for the Museum of Polo and Hall of Fame. Other artists include Lynn Carlisle, an Aiken resident who is well known for her paintings of horses and of dogs. One wall is devoted to Susan Easton Burns, an abstract painter from Atlanta. "Susan doesn’t paint with a traditional brush," says Taryn. "She uses knives, hay, even shavings. This gives her work an interesting texture." At the back of Equine Divine, shoppers can find a selection of upscale women's clothing from designers often found in Palm Beach. "I’ve always worn J. McLaughlin clothes and I think it’s a great line," says Taryn. "I asked them if they’d be willing to work with me, and they were. We also have Jack Rogers shoes. I wear them myself, and you couldn’t find them anywhere in the area. 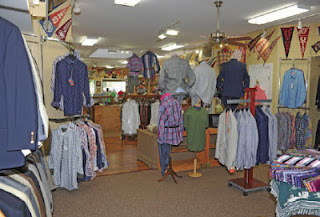 I wanted to make the fashion part of the store things you couldn't get in Aiken, and it’s been very been successful." Other notable items include Jack Van Dell jewelry, which features rings, earrings, pendants and bracelets with an equestrian theme. These pieces are fine art in themselves – white gold horse head earrings with diamond studded rings in their mouths, a gold and diamond pendant shaped like a riding boot. Equine Divine is the only place outside of Florida that carries Jack Van Dell’s work. For those who are looking for something a little easier on the pocketbook, there are rings and pendants made by Beverly Zimmer, an Aiken resident, jewelry designer and sculptor. There are as necklaces of antique silver crafted by Heather Crespo, a jumper rider who is married to Gabriel Crespo, a 3-goal professional player based in Aiken. "One day in the 1970s, William Post's widow came into the store, and she had a card with the sketch on it," says Van. "My father thought it would make a good logo, and he asked her if he could use it." Aiken Polo Club adopted the same sketch, and these two entities are the only ones given permission to reproduce it. According to Van, business at Lionel Smith has been quite good lately. "We've been selling a lot. I think people are tired of the economy, and they're tired of not spending. I think they’ve decided to go shopping to make themselves feel better." The equestrian community often gives the store business, since traveling riders might be in town for a horse event, and then find that they need formal wear that they did not bring with them. "We sold some tuxedos that we didn’t expect to sell for the formal dinner at the Steeplechase. We're selling a lot of bow ties to the younger people." One of the most popular bow ties for horse people was made especially for Lionel Smith – it is blue and embroidered with the distinctive polo logo. "If I find a necktie or a bow tie with horses on it, I buy as many as I can," says Van. "I can’t keep them in the store." Other items that horse people might appreciate include leather belts that are fastened with a folding hoof pick. It's a small hoof pick, but an authentic one, and you could use it if you had to. "They tell me they only sell these belts in two places: here and in Middleburg, Virginia," says Van. "Other places, people wouldn’t know what they were and wouldn’t appreciate them." 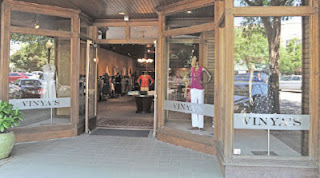 On this same block, shoppers can visit Vinya, which stocks fashionable women's dresses, blouses and slacks from such designers as Ecru, Tribal and French Connection. If a customer loves the clothes but they don’t quite fit, Vinya provides a seamstress to take up hems and tuck in waists. There are chic designs and fashions that are hard to find outside of a big city. Next door, Folly is also a recent addition to the block. 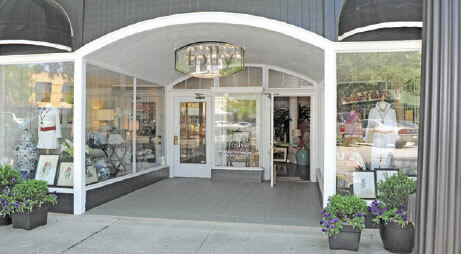 Opened last September, Folly is filled with fine linens, tableware, clothing, unique necklaces, belts and bracelets. Hats are a Folly specialty – they had quite a good selection provided by the Madder Hatters this spring. It was perfect timing for anyone who wanted to compete in the hat contests (or just look the part) at the Aiken Trials and the Aiken Steeplechase. Folly even sold a straw hat to the event rider Boyd Martin, who wore it to the formal jog at the Rolex Kentucky Three Day Event in April. Of course, Aiken's boutiques aren't limited to art and fashion. Those who love to cook must visit Plum Pudding, which has the best kitchen items anywhere. Those who are interested in wildlife should check out Birds and Butterflies, where they will find an excellent selection of bird feeders, including some lovely and artistic hummingbird feeders. And if you adore Great Britain, The Curiosity Shop on the corner of Newberry Street and Richland Avenue is the place for you. This store, opened in 1998, is devoted to anything that comes from the British Isles. There are imported hats and caps, t-shirts, tartan plaid scarves and Beatles memorabilia. You can buy items featuring Celtic designs, and books from and about England, Ireland and Scotland. Have a favorite (English) football team? Buy a mug with its insignia. Always admired those English walking sticks that fold out to make a stool? You can buy one here. Another Curiosity Shop specialty is the grocery store. Brits who are homesick for their favorite candies and cakes can find them on the shelves. They can also find genuine British tea – the stuff sold in our grocery stores is generally weak, according to many British visitors. The teas at the Curiosity Shop are imported from England and are available bagged or in bulk. And the Curiosity Shop is probably the only place in the area where you can buy beef bangers (Scottish style sausages) and even the Scottish national dish, haggis. Haggis is not for the faint of heart. Traditionally, it is made of a sheep's heart, liver and lungs, mixed with oatmeal, suet and onions and boiled for several hours in the sheep's stomach. The haggis you can buy at the Curiosity Shop comes frozen. It may not appeal to the casual or uncommitted Anglophile, but if you are a Scottish expatriate, it might make you feel right at home. And so there you have it. From art and clothing to tablecloths, tea, and even haggis, Aiken has something for everyone. There are imported items and things made in the U.S.A., quirky local specialties and top quality items with international appeal, all in just a few charming blocks. Makes you want to go shopping.